Metric thread nuts and bolts are used in products made in every country in the world, except for the USA. 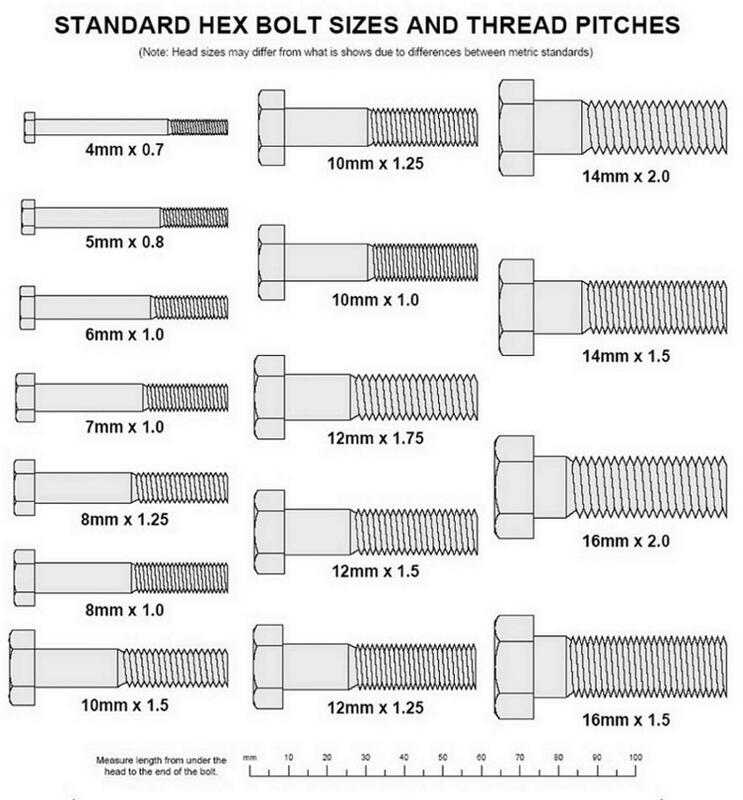 Size: Metric bolts (male thread) and nuts (female thread) are named by the outer diameter of the male thread. The name begins with a capital M and the size. So an M4 bolt is a 4 mm metric, M5 is 5mm metric. Pitch: After the size is the thread pitch, which is the width of each thread. A 1.0 pitch is 1mm wide, so 10 threads are 10mm. A 1.25 pitch is 1.25mm wide, so 10 threads are 12.5mm. A 1.50 pitch, 10 threads are 15mm. A metric ruler laid alongside a bolt, can measure the length of 10 threads. Then the thread pitch is calculated by dividing by 10. Length: After the pitch is the length, in millimeters. The length of a bolt does not include the head. It is the length of the shank, from the base of the head to the end. So a M6 x 20 hex bolt has a 20mm long shank. But counting it’s 5mm tall hex head, the total length is 20 + 5 = 25mm. Four views of the Myrons pin cushion, used for thread identification. The orange color labels are American threads. The white labels are metric. 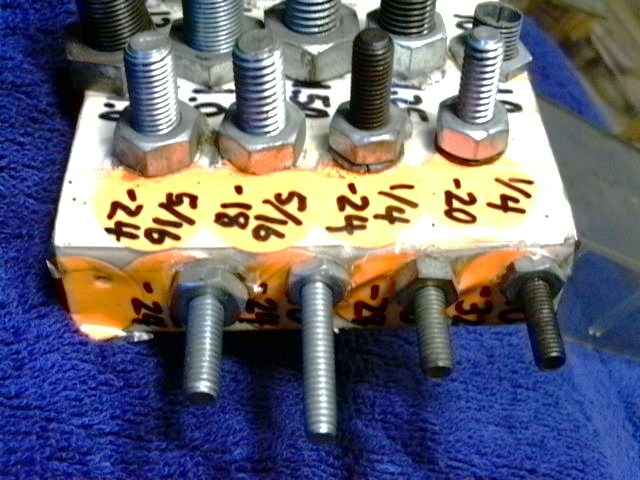 Some threads are very similar and require screwing a reference nut onto the reference bolt and the test bolt. Some threads are different enough to recognize by eye, after getting familiar with the sizes. 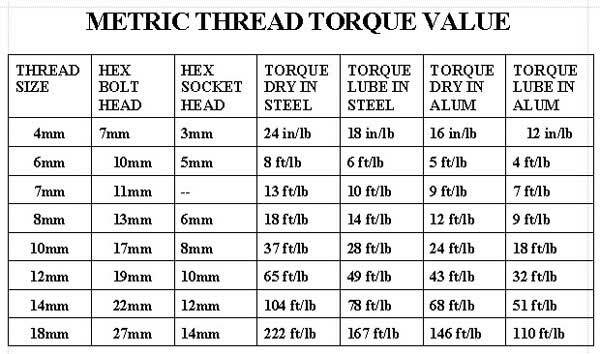 Different size bolts under different conditions require different t ightening torques. 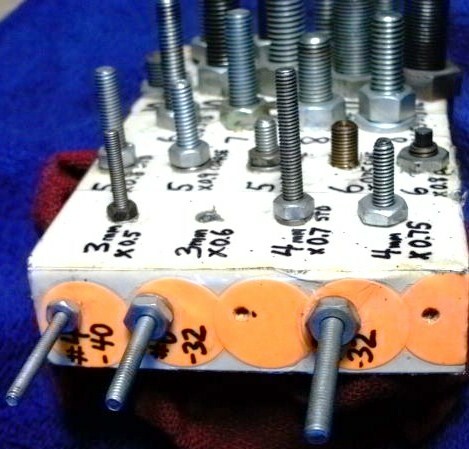 Lubrication helps the behavior and performance of threads. 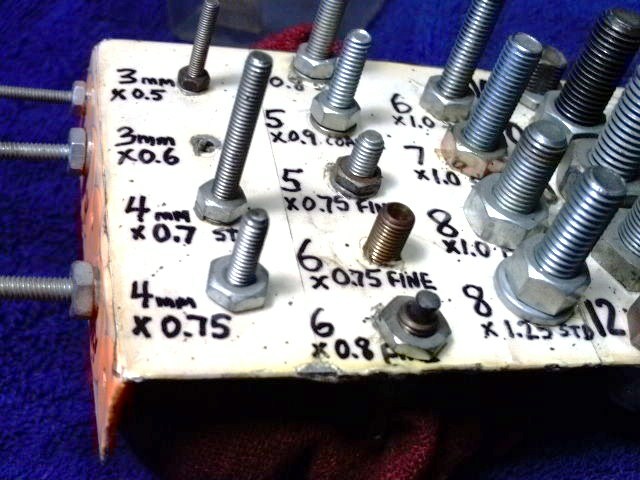 Some new nuts and bolts, mostly from China, will actually fail without lubrication. The threads will bond together when tightened fully. Always wipe grease or drip oil onto new or used threads, especially inexpensive soft metal ones. When threads fail or get “stripped”, they either “shear” off into thin curls, or “smear” off, where the tops become lower and the valleys become higher.